For some reason, this past month has been calm and quiet enough that it has sent me looking out the back windows and thinking about the decade we closed in the end of December. I don't think I've ever done that before. There were years that ended with a wiping of the brow and a "good riddance" from me, but in my personal 5 and a half decades, I've never looked at one as a chunk of time before. The "aughts" were quite a gang. I haven't decided completely if they were a gang of thugs or a gang of friends. Personally and in the world, so much has changed in such a small period of time. Without a doubt, this gadget I am thumping away on is the chief cause of much of it. It is difficult even to remember life before! Up until 1999, my sister and I had a brick and mortar shop with a website AND a cart, and we were pretty far ahead of the pack in that regard. At least 50% of the country still wasn't online. Almost all business was conducted via fax or telephone, and very few suppliers had sites (or email). If they did, they didn't have online shopping capabilities. We knew all of our suppliers from talking to them over the phone or meeting them in person at conferences and festivals. It was not unusual to drop a letter in the mail to request a catalog, since not all businesses list phone numbers. After a brief business hiccup, the magazine was started in '02 and did not have an on-line presence for a full year. Can you imagine? 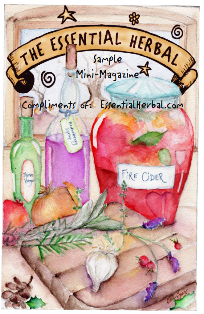 I traveled to as many herbal events as possible, and used a few other tricks, but looking back... it was a rough time to get traction. That was the year I met my sweetheart, and without im's and emails it's hard to imagine how we could have made it work. In fact, it occasionally amazes me to think about the people I converse with on a given day, and how many continents they come from. This is nothing for someone under 30, but for those of us who remember not being allowed to talk to the kid a town over on the phone because of long-distance charges, this is nothing short of a miracle. As late as '99, we were dialing an 800 number and a 5 digit code prior to dialing a long distance number in order that it would only cost 5 cents a minute. By '05 the blog was up and running and things started to really take off. '05 was a big year. Mom died and we moved into this house. Molly changed schools. The magazine was now large enough for bulk mailing rates. We could write about the gardens here and post pictures. We added recipes and instructions, tutorials and poems... We fell in love with blogging and were reaching more people through the magazine than ever. We started meeting lots of herbies who send interesting, unique articles for each new issue. Heady stuff! The next year my brother moved in here for a 3+ year losing battle with liver disease. That was a true learning experience. Some things were just clearly reinforced. For instance, when I gave birth to Molly, motherhood was a struggle. Not because I didn't care enough, but because I too closely identify with whoever is in my care. To this day, if Molly (20) needs to blow her nose, *I* sniff. Taking care of my sister's dog while she's away this weekend, I woke up several times at night wondering how difficult it is for him to wait until morning, both mornings dragging on clothes and going to let him out long before the sun came up. Some people think I am cold and don't have pets out of selfishness. The truth is that it's too darned painful. So anyhow, you can extrapolate from those things just how challenging it was to care for a terminally ill sibling. I've already forgotten more about the horrors of liver disease than I ever thought I'd have to know. Certainly the internet helped us take care of him, and even keep him alive longer. We found information and got guidance that was truly helpful. When he didn't make it, the internet was filled with solace and kind words. As the decade grew older, my child got her driver's license (we had to schedule the test on-line), moved from high school to college (applications for everything - on-line), and has become a fairly independent, strong, interesting woman. Facebook arrived somewhere in there, and brought along vast amounts of information and news of current events. Actual news from either the TV or newspapers is bland and passe, while there is no end to the information available on-line. The business page for the magazine has been so much fun to work on! Now that I'm getting the knack of it, something new will surely come along that I will need to figure out. This morning I was reading a trade journal (print, btw) on computer mechanics and the notes from the editor concerned when they would eventually switch to an on-line magazine rather than print. It's a little odd that they are just now having this conversation considering the material inside... and they are working with information gathered during a '06 survey. Four years in that decade might as well have been 25 years in the first half of my life. Eventually it will be a conversation I will have to have with my readers too. Probably mid-decade, I assume. The post office may not even exist by then, and what about printers? If you think I'm exaggerating about the post office, ask a 20-something when they last mailed something. Ask them how much the postage is for a one ounce letter. So... that was some decade, wasn't it? We had a lot of fun. We had a lot of heartache. And now we're ready to see what this decade has to throw at us. I'm afraid this will be the decade during which I learn that I can learn no more :-). So often while we were growing up, we marveled at our grandparents and how they watched as cars replaced horses and buggies, and men went to the moon. They didn't make it to see computers. Mom just barely made it to the emailing era. What miracles will our children see? There actually was a point to the trip to NY a few weeks ago, and that was to find fun things to add to the website that herbies would love. 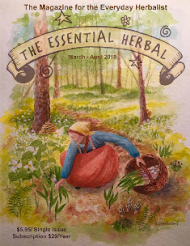 They have been arriving (although not quite all here yet), and I'm pretty excited about it and enjoyed adding them to The Essential Herbal website . 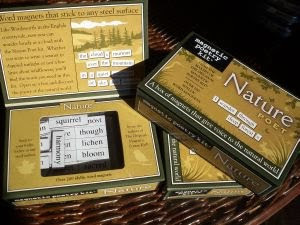 First up are the Magnetic Poetry in themes like "Healing Words" and "Nature". We've been big fans of the standard version for years. I stopped to read the door of the freezer today, and was really stunned by some of the poetry, haiku and imagery stuck up there by the people who pass through. 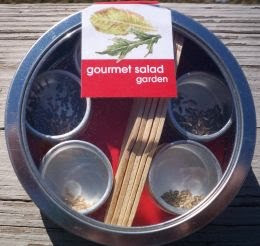 We got tins full of seeds that are all organic, themed to create specific gardens. Small tins make me think of guerrilla gardening adventures while the larger vegetable garden for containers is really fascinating in the varieties represented. 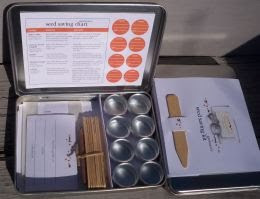 There 9 various choices to look over, AND THEN we got a seed-saving kit, filled with everything you'd need to get started saving your own seeds. I really love that one! I just finished putting up some implements like teaballs, and such. I expect we'll be adding to this category, but since we have tea it just seems to make sense. As more arrives, it will be posted here! Horseradish (Armoracia rusticana) is a member of the mustard ( Brassicaceae ) family, known for the sharp taste that immediately opens our sinuses when eaten. It has been cultivated for at least 2000 years, but the exact origin is not known. Delicious on meats, vegetables, potatoes, and seafood, it is rarely used as an everyday food. That may change a bit this year, as the Int’l Herb Association has chosen Horseradish to star as herb of the year in 2011. More than any herb they’ve chosen in the past, many of us have a lot to learn about Horseradish. We are so spoiled here! I wracked my brain trying to come up with a new way to approach this Herb of the Year, and literally smacked my forehead when it dawned on me that some of the best Horseradish in the world is grated and sold fresh right here at our amazing Central Market 3 days a week. Let me tell you a little about “our” market. One thing that almost all Lancaster Countians have in common is our immense pride in the Lancaster Central Market. In 1730, Alexander Hamilton included it in the original plan of the city, and conveyed personal property to the City of Lancaster in a deal that ensured that the market would always be there. It has run continuously from that time, with a building being constructed first around 1757, and then being remodeled into our outstandingly beautiful current market house in 1889. Central Market continues to be the jewel in the crown of the city. On market days (Tuesday, Friday, and Saturday), the city teems with shoppers. It is a real testament to the vision of Alexander Hamilton that this one vibrant part of our heritage has been the thing that kept our town from suffering the fate of so many similar towns. Michael J. 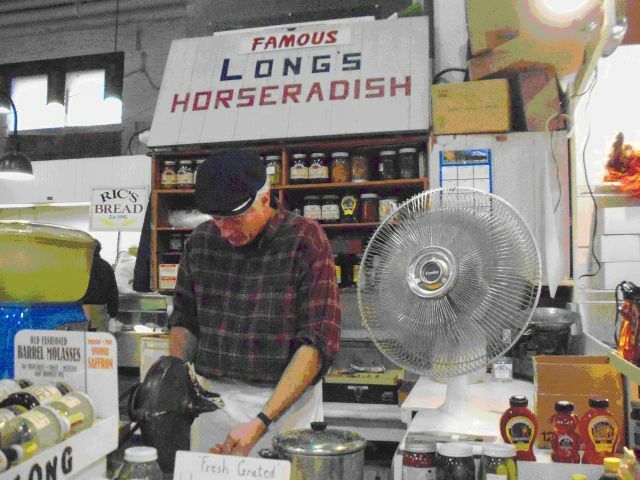 Long is the 4th generation of Longs at the helm of Long’s Horseradish. The family has held a stand at Central Market since 1930, having started the business around 1906. It was originally started by the Goldbach family (Michael’s father’s maternal family), changing over to Long’s with Michael’s father. Throughout all those years, the Horseradish stand has been there (Tuesdays and Fridays only). They always have a fan blowing the pungent scent of the roots over the market house crowd as a utilitarian iron grinding machine is put to service throughout the day. That scent to me IS the smell of the market house, and I’m certain that the beams are infused with it. As the roots are ground, they are periodically added to a kettle, covered with vinegar, and the lid is replaced on the kettle immediately. The hood that covers the grinder must retain a lot of the scent, but Michael told me that many people have gotten teary eyed in front of the fan. H.J. Heinz is probably the oldest continually operating Horseradish processor in the country. 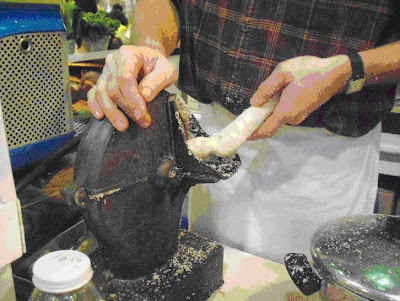 Since Horseradish is a seasonal business, a second income was generally needed to tide families over during the off months. Heinz went with tomatoes while the Goldbach/Longs were tinsmiths in the early days, and as transportation and refrigeration improved it became a year-round occupation. While the Longs do grow Horseradish for personal use, what is used for production is mainly from the Mississippi River Valley states, and they are beautiful, fleshy white roots. As I asked that question, I already knew the answer. We were asked that all the time when we had an herb shop, but with success comes the inability to do both the growing and the business end, so it becomes necessary to rely on growers. I’ve only ever known good, fresh Horseradish – except the rare “off-brand” cocktail sauce that people unknowingly serve, or the even rarer sauce (if you can seriously call it that) served with a fast-food roast beef sandwich. We are so privileged to expect the best because it is the only thing we know here! The Horseradish will have been ground between 2 and 4 hours earlier if purchased at market, but Long’s is available at grocery outlets as well. They also make a superb cocktail sauce, full of zing, and spicy mustards. In fact, I only put it in my own garden this past summer when a good friend sent me a piece through the mail. It is so easily available I never considered growing it. Recently, Dr. Oz talked about the three herbs we should add more often to our diets. They are: Rosemary, Saffron, and Horseradish! He added that Horseradish is very effective at helping digestion and liver detoxification. The gall bladder is stimulated to release bile when we eat Horseradish, making it a great alternative for digestive problems. Ah, but the good doctor merely scratched the surface! The root contains a cornucopia of vitamins and minerals. Higher in vitamin C than oranges or lemons, it also contains lots of vitamin A. Add a healthy dose of chromium, magnesium, phosphorus, potassium, riboflavin, calcium, manganese, niacin, and zinc, and we have a nutritious condiment that deserves a more revered place on the table. The diuretic effects of Horseradish can be helpful in cases of bladder infections and kidney stones, and it also increases perspiration, which can lower fevers. It is antibiotic, anti-oxidant, anti-microbial, and anti-inflammatory. It’s very hot taste comes from the glucocides sinigrin and 2-phenylethylglucosinolate. When cut, cells are crushed, enabling an enzyme called myrosinase to interact with these two substances, releasing the oil, explaining why a Horseradish root has no smell until it is cut, grated, or ground. It also contains glucosinolates thought to provide resistance to cancers. The root is considered beneficial in cases of lung infections, sinus problems, arthritis and gout. Although there is much written in reference to using Horseradish externally (think mustard plaster), the juice can cause blistering of the skin, so caution is advised. In fact, the essential oil is classed as hazardous. Horseradish root is a staple ingredient in the Fire Cider recipe popularized by Rosemary Gladstar, and that can be found easily on the internet. Boil ground Horseradish root with brown sugar and a small amount of water. Horseradish Juice is taken ¼ to ½ tsp between meals to improve sluggish digestion and decrease indigestion. 1 t freshly ground Horseradish mixed with 1 T honey and steeped in I c hot water, drunk like tea. One cannot be “the Horseradish man” at market without gleaning lots of great tips for uses of Horseradish – as if 4 generations of passed down information weren’t enough. Michael told me that no matter what the recipe says, ALWAYS add the horseradish to the dish last during cooking. This is backed up by my research, that emphasizes high heat kills some of the beneficial medicinal properties of the root. The only exception to this rule would be when coating a roast with Horseradish prior to putting it into the oven. In that case, the flavor will penetrate the meat and be even more delicious. A customer told him to try making gravy with the drippings from that same roast, and he assured me that it is heaven on earth. Another surprising tip he passed along is to cut the leaves before they get to 12” high, and take out the center vein. Sauté them, or simply add them to salads for a surprisingly delicious and different flavor. And now I am glad to have planted a bit in my own garden! My Mom's favorite at Thanksgiving was twice baked potatoes.. and then my Sis in Law kicked it up a 'notch' with horseradish. A goodly amount of freshly grated horseradish in a clear bottle of vodka makes a simple and most excellent "snow globe" holiday gift -- just add a big red bow. Bonus: the bloody marys get spicier with every shakeup! I add horseradish to my beef stroganoff. My mom knew there was a difference when I made it but couldn't figure it out. Why do I love Horseradish? I first fell in love with it in my late 20s when I was rescued from a lonely, alone-in-NYC-Thanksgiving, by my friend's Mother-in-Law. I was whisked out of the city to Long Island, where I discovered I could see the sky on that crisp Autumn Day. My hostess lived near the Long Island Sound so we took a long pre-feast walk along the pebbly shoreline to the place where the Sound opens to the Atlantic. The winds whipped at my face and I was chilly yet at the same time flooded with the heat of all that thrilling expanse of ocean openness. Our walk ignited our appetites, so we nearly trotted the 1/2 mile back home. Enter Horseradish. I was offered first a glass of rich California Chardonnay, then presented with a huge platter of smoked, flaky, not too salty salmon and a bowl mounded with what looked like whipping cream??! My Hostess handed me a cracker, with a hunk of the salmon and an alarmingly large dollop of whipped cream. Thinking sweet pie whipped cream, I braced myself, praying I wouldn't gag. I was glad for the wine. With no desire to be rude, I took a bite and to my delight was consumed with a heated blaze which soared from my mouth into my chest, into to my nose, and I am sure out my ears. But the taste! Sublime! I sadly don't have the exact recipe for this (she doesn't have a recipe - one of those cooks who always cooks on the fly), but it is simply a gradual folding-in of whipped cream with freshly grated horseradish and a pinch of salt. She mentioned something about lemon juice "perhaps" but I've never used it. My devotion to horseradish was sealed about 6 years later when my son, 3 1/2 at the time experienced his first earache. It seemed to hit him out of nowhere, on a Sunday of course. His sudden wails of agony stripped me absolutely bare. I'd handled fevers, stuffy noses and coughs but this was sure to crumble the tower within. I tried onion poultice. No change. This happened at a time when we were fortunate enough to have a Homeopathic Pediatrician who was also of a certain age. I phoned his S.O.S. line and his first words were "Have Courage." Okay. Got it. 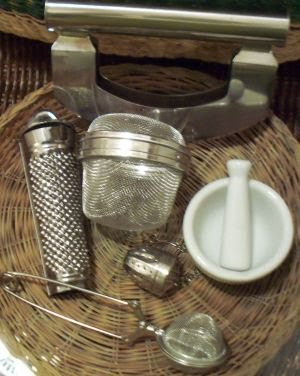 Next he gave me instructions to grate some horseradish and put it in a cloth and massage it behind his ear. My dear husband drove to the gourmet market we knew would have one, while I continued to rock our son, and admittedly did some weeping myself as I sat there feeling helpless. As soon as my husband returned, I made up the warm poultice and within moments, moments of applying this poultice the wailing ceased. All over, done, fini. Whew. Process: Take one fresh horseradish, grate approx 1 tsp. finely, and warm this a little bit by pouring a tiny amount of very hot water over it. Scoop it up and place in a small soft piece of fabric, flannel is soothing, but anything you have on hand will work. Twist the fabric, making a small ball where the horseradish is (think little lollipop) and then right away gently massage the back of the ear, just where the ear meets the neck. You will want the horseradish poultice to be nicely warm, but not so hot that it hurts the delicate skin. You can also palpate the area and in older children and adults they will be able to indicate where the pain is. Massage the area gently until the skin turns pinkish. Adults can take a little more time than small children who's skin is so delicate. You'll need to keep close watch because you don't want it to burn the skin. Repeat in a little while if needed. Keep the entire ear warm afterward with a soft cap and my rule of thumb is not to go outside until a few days after pain has ceased. The horseradish gets the fluids moving, unblocking blocked Eustachian tubes. I've used this technique on both myself and my husband with the same rapid success. It did not work on an earache of mine once which turned out to be fungal rather than bacterial. Of course none of this is intended as medical advice! The new issue is out, full of late winter, early spring herbs, recipes, musing, crafting, and general wonderfulness. Take a gander at the table of contents below! 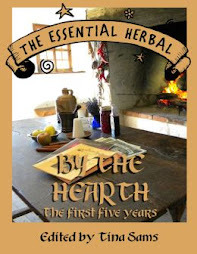 What exactly is an herbalist these days? Simple recipes to enjoy these beautiful spring blossoms and stems. Learn the herbs that help the body handle stress and find balance. A fun craft gives the birds a treat while they wait for nature to produce. Easy, natural ways to clear the winter gunk and be ready for spring. Planning the garden – what a concept! Much more than a Christmas tree! Muscle Response Testing – what is it? Can *I* do it? A sultry, feminine soap that feels as good as it smells. We love to drink it, but here are several recipes for body care using tea. 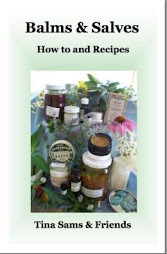 Wild greens, rhubarb, and violets are all utilized in Susan’s recipes to welcome Spring. How to identify staghorn sumac, and what to do with it when you’ve got it. Great ideas and recipes that can be used by anyone, with or without children. Keeping the bushes healthy and productive. One woman’s decision to bloom where she’s planted. Wonderful advice from seed to garden. All that’s left is the harvesting! Cinnamon is becoming a well known medicinal herb. Try it as a tea! A visit to Loc Tay through Cath’s eyes. Need a little pick-up while you wait for the sun to return? Lots of great ideas here. Our book is out of print, so we’re printing it in sections for our readers. 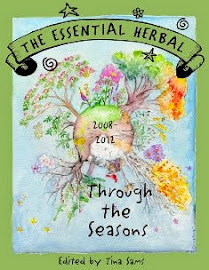 Taurus, it’s your turn to find out which herbs are your friends. A bit about ramps, plantain, and chickweed. There's talk about a warming trend. Last year we got 40" of snow in the first half of February, but up until February, we'd had almost nothing. In contrast, this year it feels like there has been snow on the ground since Halloween... or was that Thanksgiving? Well it's been a l-o-o-n-g time. Some years it doesn't much matter to me what happens outside. Most years, in fact. I like all the different weather we get here, but this year the snow has been around too long. I yearn for some GREEN! This year spring can't get here fast enough. I need it now! Today we had our first warmish day for a long time. The snow is finally starting to give way. I pulled on some boots and had a look around. There's not a whole lot to see just yet. The horehound is amazingly continuing to grow. I didn't take a picture, but don't mind saying that I find that a wee bit scary for its neighboring plants - the fennel, gooseberries, and something else that I can't remember at the moment (it's still buried under the white blanket). There are three rosemary plants out back. They really aren't fond of the bitter cold temperatures that we got this year, especially before they were covered with snow. Looking at this one, it's hard to say whether it will survive or not, but the lower part of the plant that was protected by snow looks more viable than the tips. The golden elderberry bush has swelling buds. Just this year I learned from Barb Steele at Alloway Creek Gardens that having more than one variety of elderberry will increase the yeild from all of the bushes. That explains the 6 weeks that I spent frantically drying, freezing, and tincturing last year (still have some dried berries available on the website, btw....). Under the elderberry, a deceptively weak looking plantain is greening up. There are many plants showing green - chickweed, garlic mustard, and plantain in particular, although most of them are still under snow. The long row of Munstead lavender is silvery white without a tinge of green yet - but I have no doubt that it will survive. I suppose it's not good to be so cocky, but the lavender seems to love the soil here, and in 5 years they've done nothing but spread and grow, needing vigorous haircuts last year. These particular plants flowered continuously for 3 months last year. The front yard only has two patches of ground, surrounding the trees. It makes me wonder about whether the roots produce some kind of energy/heat. Certainly there isn't as much snow under trees, since the branches would form a shield, but this is kind of interesting. This coming week we should head towards 60 degrees by the end of the week. I can't wait! Yes, I get to live my dream. That's pretty much always been the case as long as I kept my nose to the grindstone and my eyes on the prize, but this isn't about me. We had many interesting encounters during the last week, and it made a big impression and gave me a lot to think about. Several times during our stay in the Big Apple, my sister and I discussed how gracious people were, and how they seemed to take joy and pride in what they did for a living. It started out with a malfunctioning shower in our hotel room. Strange plumbing is always a challenge for me, so I dragged Maryanne into the bathroom to see if she could get it to work. Nada. Then I called the desk and asked if there was some trick to it. They sent up maintenance, and it turned out that a part needed to be replaced. The Russian man who came to fix it turned down our offer to go to breakfast while he worked, and had it done in about 15 minutes. My sister joked that back home it would take several days, and he said, "Ah... but this is the Holiday Inn!" and smiled as he left. At breakfast, our waiter Singh asked where we were from, and we found that his cousin has a gas station in the area we grew up, and a home less than a mile from our old house. He told us how he loves our town, and that his family in India are farmers. I asked if it was a difficult transition from the farm to NY, and he agreed that it was. He took very good care of us during our stay, and made a point of saying goodbye on our last day. Later, on a shuttle ride to the trade show, we sat close to the driver. We watched as a driver in a small car pulled out of an icy space and did a u-turn directly in front of the bus, and that led to a conversation with Lena, our driver with a very thick Spanish accent. She doesn't like driving in the city much, preferring runs to Atlantic City, but they needed her. She told us that she has 4 awards for her driving, that her daughter is a doctor, and that she is very proud to wear the uniform - even if her mother doesn't understand why. Her bus company gave her a diploma, and it was the only diploma she's ever gotten. She framed it and it means as much to her as a PhD might to someone else. She LOVES her job. This is in contrast to some women who sat near us on another shuttle and discussed the various merits and disappointments in exotic vacation locations they've visited. Or the vendor who told us about how difficult the grind is going from show to show (and I do know that's true). Or the goof on the train home, trying to impress a young woman with tales of how much work he manages to skip out on. This is not a commentary on immigration. NY is a thrilling mixture of accents, nationalities, and ethnicity. I cannot imagine what it would look like if it were homogenized, but still that's not the point here. So often my friends and I talk about perspective, attitude, and creating our own reality. Over and over we were treated to living, breathing examples last week. None of these examples were typical goals that we think of in our lives, but these folks were living their dreams. It was inspiring to see. All work has value, but it is up to us to find the happiness in it by taking pride in our performance of that work. We'd been muttering about how long it's been since we attended a wholesale show for a good while, and Sunday we decided to head out for NY the next day for the International Gift Show in NYC. Skipping between weather fronts, we got on a train and went. The city is full of interesting things, and sometimes the smallest things are fascinating. We ordered pizza, and found that it arrived with a pile of packets of herbs and spices. This probably isn't all that unusual to other people, but since we don't live in an area that has food delivery, it was pretty interesting to see. Our friend Laura took us to see the musical WICKED, and it was fabulous! The entire theatre was transformed into Oz, with fanciful artwork, furniture, and employees in character. It was a wonderful experience! I'd read the book years ago, but the musical was so much fun and so BIG! Outside the theatre I took this picture of Laura. She's a very talented singer and actress, so I would love to see her picture on the poster! Our main goal (oh yeah, I forgot...) was the trade show. Pictures aren't really allowed, so this is the lobby just prior to getting on an escalator into the fray. I snapped a shot in the middle of one aisle just as the show was opening one morning. There are at least 50 aisles. They were on three levels, so it got confusing. The building is 2 city blocks wide, and it feels like about 3 blocks deep. There are literally miles and miles of booths. Only a small fraction of them held anything we were interested in, but the linens, tabletop, artglass, holiday, etc., etc., etc., were eyecatching. One needs to be very careful to avoid purchasing something that while exquisite, has nothing to do with their shop. I dumped the catalogs from one day on my bed at the hotel. Having internet in our room was pretty cool. Here's Maryanne keeping up to date with the news in Egypt. Or maybe playing some game. Either way, it was good to be able to stay on top of emails and business while hundreds of miles from home. Our last night there, friends Rob and Laura took us to a great restaurant up the street - Strata 57. Rob got the squid-ink pasta and we all got a taste. It was delicious. We all enjoyed every morsel. This picture of our friends came out like a painting because of the lighting, and I really like it. On our last morning, a friend that we'd only met on-line trekked into the city to have breakfast with us. Carey was delightful to meet, and it was as comfortable as seeing an old friend we'd known for years. Then it was time to go home. We got checked out and decided to have a quick soda in the bar before grabbing a cab to the train station. Only $9.50. Hahahahaha... time to go! Maryanne is looking ready. Just for posterity, this was the view from our room. Lots of snow, slush, and ice, but the tree below showing signs of spring. We were happy to be on a lower floor, and surprised by the lack of noise. It was a great stay. Right across from the station, the US Post Office stands, and you can't really read it, but the motto: Neither rain, nor snow, nor gloom of night... is engraved over the columns. Since I am so involved with the post office in my business, I snapped a picture. We got to the station with plenty of time for people watching. Crisp businessmen and high, high heels were the most striking visions for me. Thousands of people passing through this room in the course of a half hour. Amazing, really. Our trip home was by far our least favorite part of the week. We'd spent 5 days in a city with a reputation for ill manners, but had been treated with nothing but kindness and an attitude of pride in sharing their city that was so noticeable that we discussed it a few times. The train ride back with people from our part of the world was very different. That's all I'm saying about that, but thanks for the hospitality, NYC! 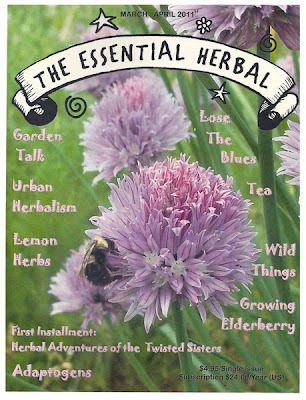 And now it's time to get the Mar/Apr issue of The Essential Herbal into the mail. It was delivered while we were gone. In the next couple of weeks, the things that I found at the show will be popping up on the website. Stay tuned!